The view was ­unbroken white for most of the flight from Iqaluit to Cape Dorset, Nunavut, with ­only the black-and-white ­mosaic of sea ice announcing our ­approach to Dorset Island. We landed just as the skies began to lower, as though the landscape were gradually being erased. The one-room airport was crowded with people greeting friends and family while a team of young hockey players ­waited ­hopefully for a flight out to a tournament—the feeling of an arena change room was compounded by their equipment bags cluttering the floor. Top banner The Kenojuak Cultural Centre, which was funded with $8 million from the federal and territorial governments, $3 million from private and corporate donations, and nearly $80,000 raised by the community. Above, left The old West Baffin Eskimo Co-operative buildings. I was invited to be part of a small delegation that visited Cape Dorset—Kinngait in Inuktitut—a hamlet of about 1,400 people just off of Baffin Island, this past spring. Our group was there to preview the Kenojuak Cultural Centre (KCC), which is set to formally open its doors in September. 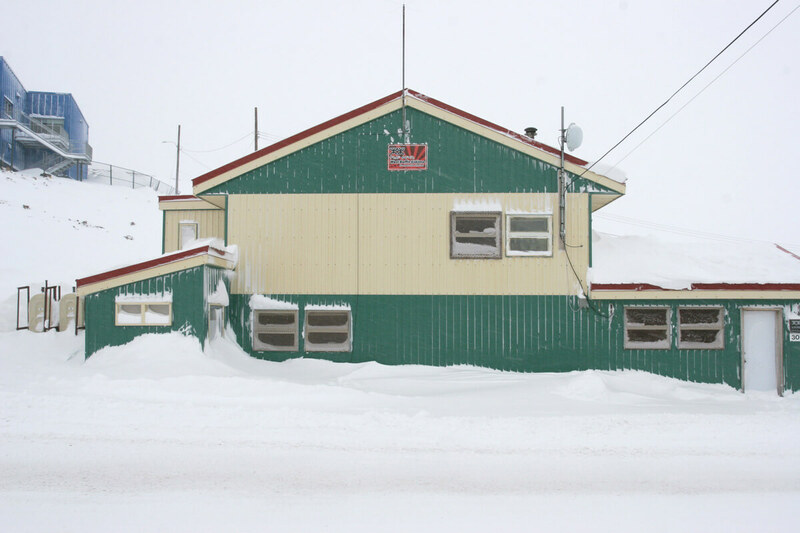 The building is named for the late Kenojuak Ashevak, perhaps the most iconic of Cape Dorset’s many artists to have produced work at the West Baffin Eskimo Co-operative. 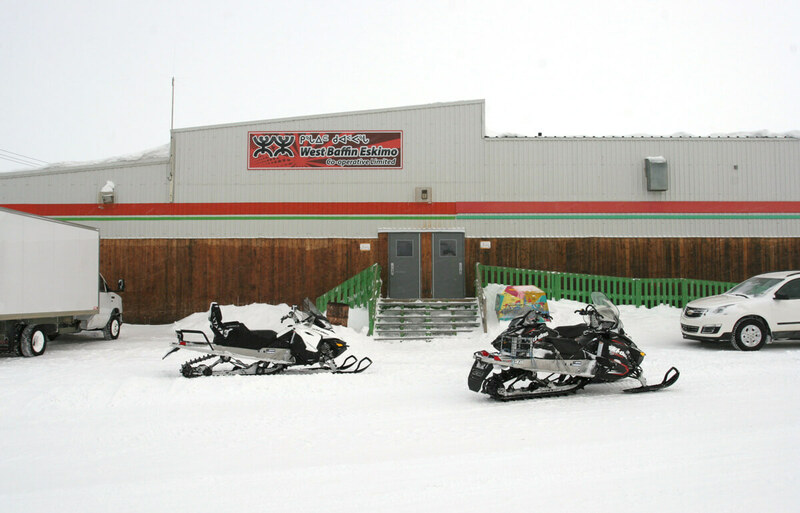 The WBEC has two parts: an all-purpose retail store, selling everything from groceries to snow ­machines, and Kinngait Studios, the world-famous printmaking and drawing facility. (Both are referred to as “the ­co-op,” pronounced as a quick quap by locals.) The centre provides Kinngait Studios with a fittingly impressive new home, replacing the buildings the artists and printmakers have worked out of for decades. 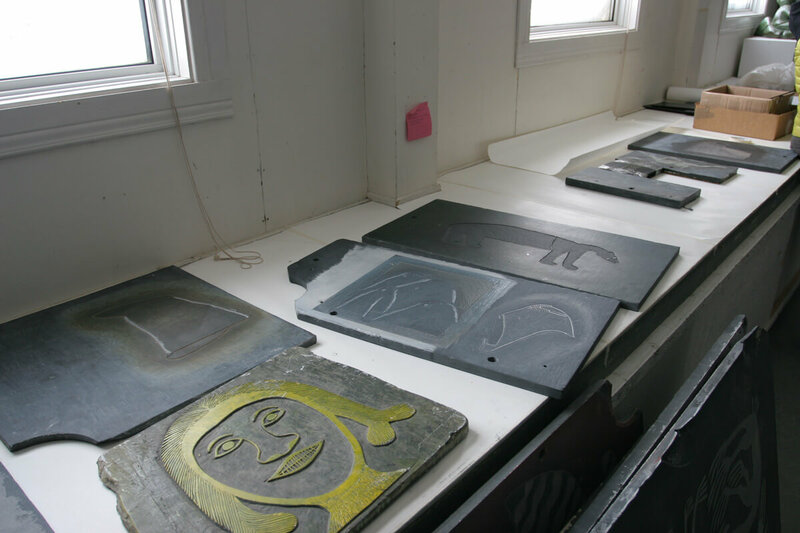 Commercial art production began in Cape Dorset in the 1950s, when James Houston, an artist and a civil ­administrator for the region, encouraged Inuit in and around Cape Dorset to make carvings, drawings, and prints to be sold in southern markets. The co-op, a ­majority Inuit-run business, began in the late 1950s, and its first annual limited-­edition print collection was released in 1959. 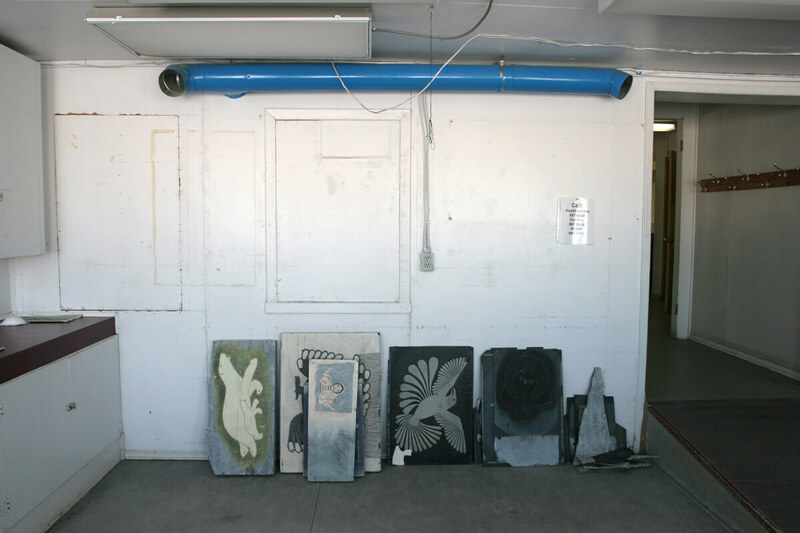 Funded by art sales, the co-op now provides artists with materials, studio space, and production facilities, as well as exhibition and ­marketing support through ­Dorset Fine Arts, its Toronto outpost established in 1978. Over the past four years, the KCC capital campaign, a collaborative effort between the hamlet and the co-op, raised more than $13 million from corporate, government, and private sources, enough for the building as well as an endowment for operations. Although there were previous attempts to build a new centre, this is the first time the community has had substantial support from major southern institutions and philanthropists. 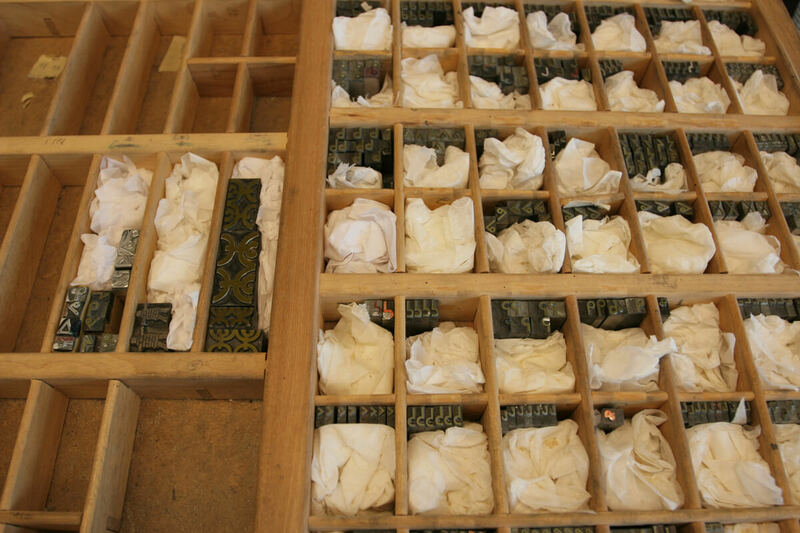 Above and left Printing blocks on display in the printers’ break room in one of the old buildings. 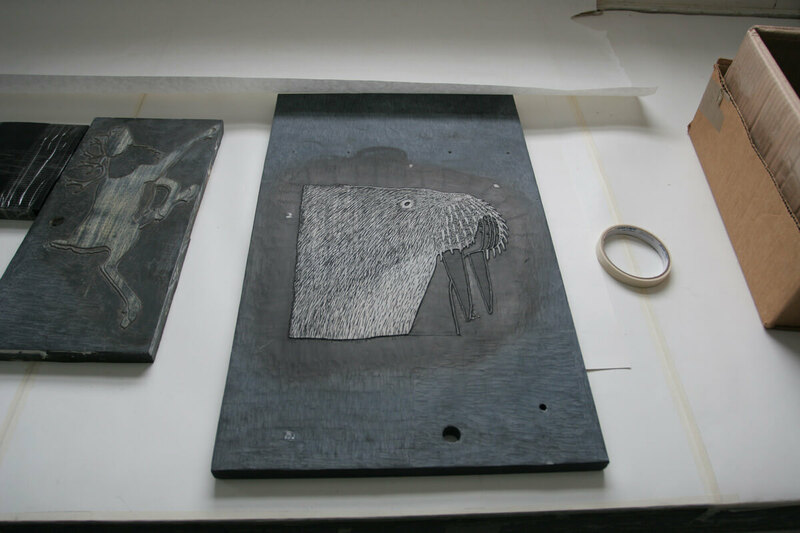 The stone used to print Ningiukulu Teevee’s Deep in Thought, 2018, which is included in this year’s Cape Dorset Annual Print Collection. The new centre comes at a time of high visibility for Inuit art, when Inuit are ­increasingly shaping the way their culture is presented and shared with the world. The Art Gallery of Ontario’s summer exhibition, Tunirrusiangit (“their gifts” or “what they gave” in ­Inuktitut), which pairs the work of Kenojuak Ashevak with that of her nephew, Tim Pitsiulak, who passed away in 2016, has been led by a team of Inuit artist-­curators. The inaugural programming of the Winnipeg Art Gallery’s new Inuit Art Centre will also be directed by Inuit curators and artists. And the Isuma artist collective is representing Canada at next year’s Venice ­Biennale, the first time art by Inuit will be shown in the Canada pavilion. The KCC, in contrast, celebrates Inuit art in the place where it is made. While it is intended as a destination for art collectors, curators, and tourists, the centre’s primary goal is to serve the community. In the second half of the twentieth century, government policies forced intense and often traumatic changes to the Inuit way of life, as families went from living on the land to living in settlements. The community hopes that programming at the new facilities can begin to counter decades of cultural loss. The new KCC will be a place for Cape ­Dorset to hold on to and celebrate its own art, artists, and culture. The KCC is a long, royal-blue box on a plateau overlooking the town, above the old co-op offices and studios. 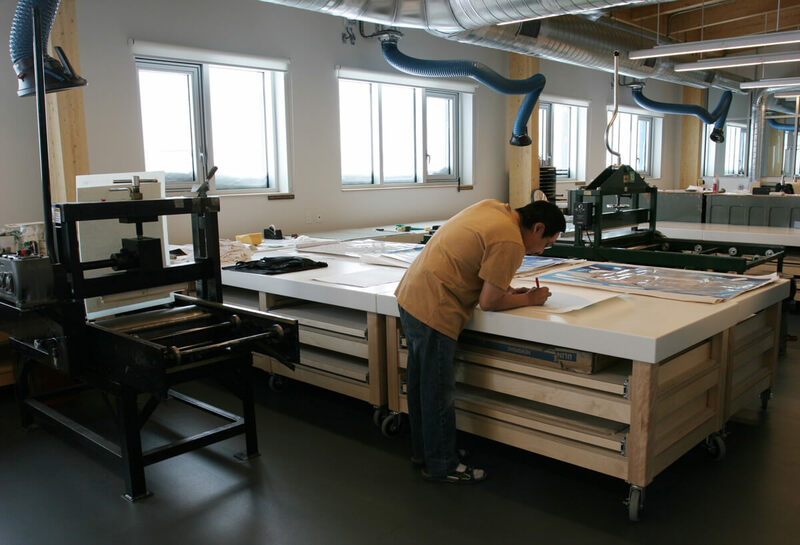 Bill Ritchie, master printer and Kinngait Studios manager for the past twenty-eight years, gave me a tour of the pristine facilities, designed by architecture firm Evoq in partnership with Iqaluit-based Panaq Design. 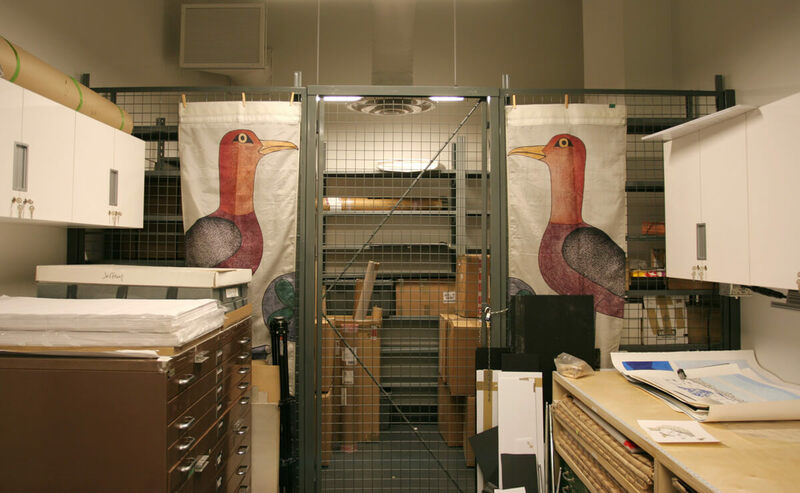 The co-op’s half of the building is composed ­mainly of a series of studios—one for lithography, producing letterpress, and etching; a separate space for making stonecuts; and another for drawing—all separated by glass walls to allow for clear lines of sight from end to end. (The other half of the building, with a public gallery and space for events, is managed by the hamlet.) North-facing windows run the length of the studios, filling the space with light diffused by the snow now swirling outside. During my visit, there was a quiet camaraderie to the place, the soft mutter of Inuktitut on the radio in the background as the printmakers worked, sometimes consulting each other but mostly in silence. 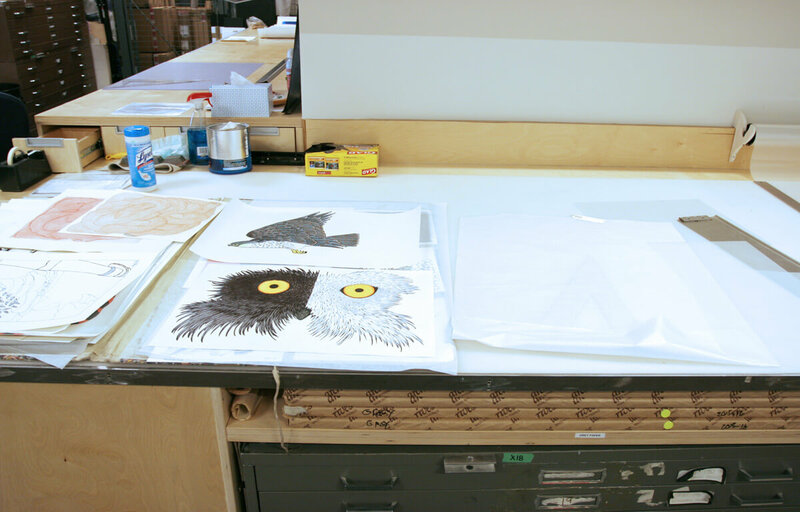 Top In the new studio, master printer Niveaksie Quvinaqtuliaq works on a Saimaiyu Akesuk print. Left The studio uses a rare set of Inuktut syllabic type. The WBEC logo, designed by one of the studio’s early graphic artists, is in the third compartment from the left. It was a Tuesday, one of two days a week when artists come to sell drawings to the co-op. Some drawings become the basis for prints; artists are paid for each step of the printing process and receive royalties from sales. Padloo Samayualie brought in a small, precise drawing of hydro poles and wires against a clear sky. She is known for her drawings of local landscapes, architecture, and scenes from her travels to shows and residencies: the Montreal airport, a plane on the tarmac in Yellowknife, high-rise buildings in New York City. ­Another drawing of Samayualie’s—a small, unsettling image of green latex-gloved hands holding a large heart (based on the Health Canada heart-disease warning from a cigarette pack), outlined in thick black like the leading of stained glass—hung in a small gallery across a long central hallway from the studios. The gallery, where artists and printmakers sometimes hang new work or projects in progress, also holds art by Shuvinai Ashoona, Ningiukulu Teevee, and Saimaiyu Akesuk. Some of the most admired artists now working in Cape Dorset, their art does not always fit ­easily into what is thought of as the traditional Cape Dorset style, which features strong graphic compositions and often ­abstracted images of an Inuit way of life that mostly predates living in settlements. Inuit stories and values and the importance of spending time on the land—hunting, fishing, and clam digging, for example—still feature prominently in Cape Dorset art today. But this generation of artists also does not shy away from confronting issues such as alcoholism and high rates of suicide—effects of colonialism that plague Inuit communities. ­Although stylistically different, the work of these new artists continues the tradition of strong women artists in Cape Dorset that began with ­Kenojuak Ashevak. “Her art is what made a way for us,” Teevee told me. Above Snow machines in front of the co-op retail store. 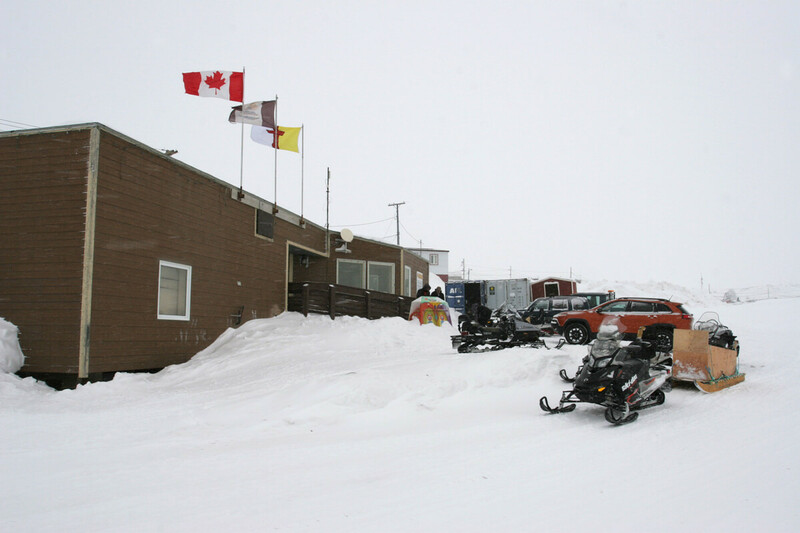 Left The hamlet office, flying the flags of Cape Dorset, Nunavut, and Canada. Community elders have long advised that a cultural centre should provide far more than studios and gallery space. Some have passed away in recent years, but their message was clear: the centre should actively help preserve Inuit knowledge. “They kept saying, ‘Work hard...get this centre going, since that’s the only way you’re going to show your history to the outside world and to your children,’” elder Jimmy Manning, a photographer, former art buyer and former manager of Kinngait Studios, and current manager of the ­co-op retail store, told me. ­Previously, given that there was no exhibition venue in town, the best of the community’s drawings and carvings were shipped south with no opportunity for the community to ­appreciate the work. That’s in part why the KCC’s opening exhibition, launching September 5, will be the largest showing of work by Ashevak in the Arctic—all pulled from the co-op’s vast archive, which is housed in Dorset Fine Arts; the McMichael Art Gallery in Kleinburg, Ontario; and Cape Dorset. Louisa Parr, the new manager of the KCC, plans to organize regular meetings of town elders at the centre, so community members and youth in particular can come to hear their stories and learn from their experiences. She hopes audio and video recordings of the gatherings will be stored in a publicly accessible archive. Top and Left Some drawings are stored in the archives; most are sent to Dorset Fine Arts and distributed to authorised galleries in Canada and abroad. (Left) A notice to carvers posted in the old offices. Carvers come in to sell work on Mondays and Wednesdays. 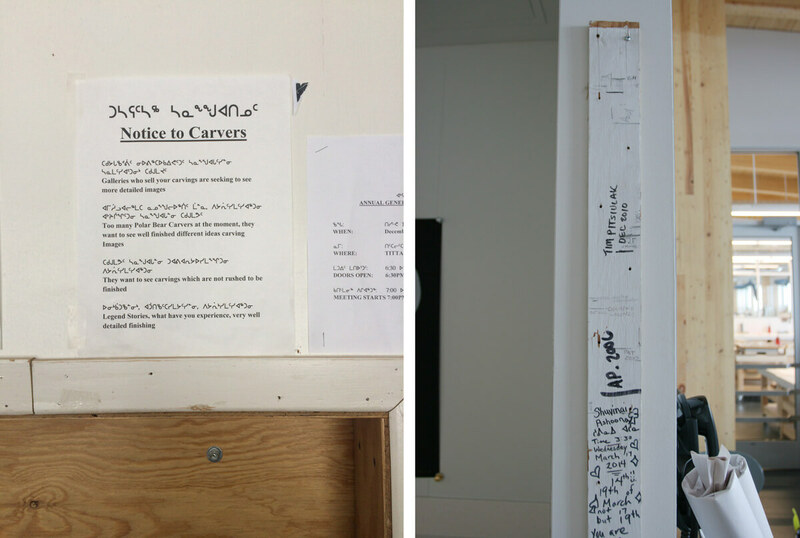 (Right) A door frame from the old co-op, brought to the KCC, is marked with the heights of staff, visitors, and artists, including the late Tim Pitsiulak. 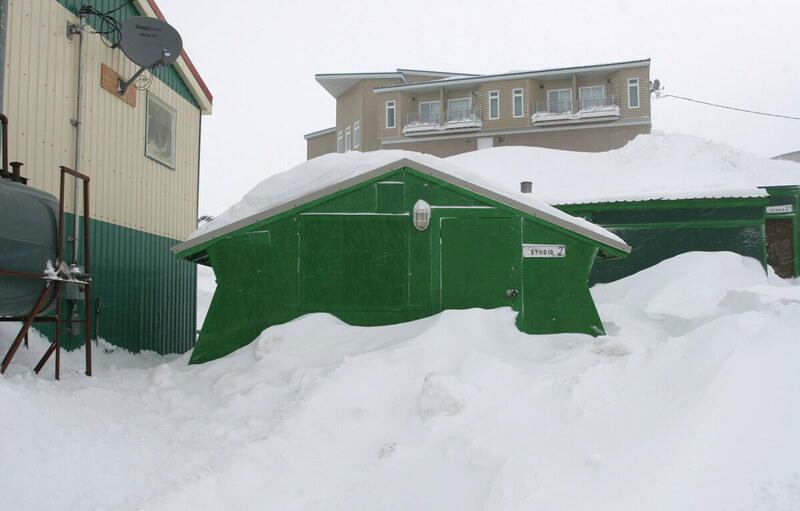 The day our delegation was sup­posed to leave, the town got snowed in again, but by midnight, the sky had cleared and the northern lights were flickering faintly, gathering briefly ­into vertical bands then breaking up into gentle green waves. The next morning, it looked like we would be able to fly out. It was quiet at the airport by then, since the ­hockey players, snowed in since the day we ­arrived, were given priority and left on the first flight out. Cheryl from First Air circulated with a pot of coffee and a giant tub of powdered Coffee-mate. Once our plane arrived, we watched as the cargo was unloaded by hand—cases of Coke to make up for a desperate shortfall in town (it had been months since the last delivery), along with construction supplies and drawing materials for the co-op—as the weather gradually worsened. Cheryl rushed us across the tarmac as soon as the plane was ready, and as we took off, the landscape disappeared into the snow. 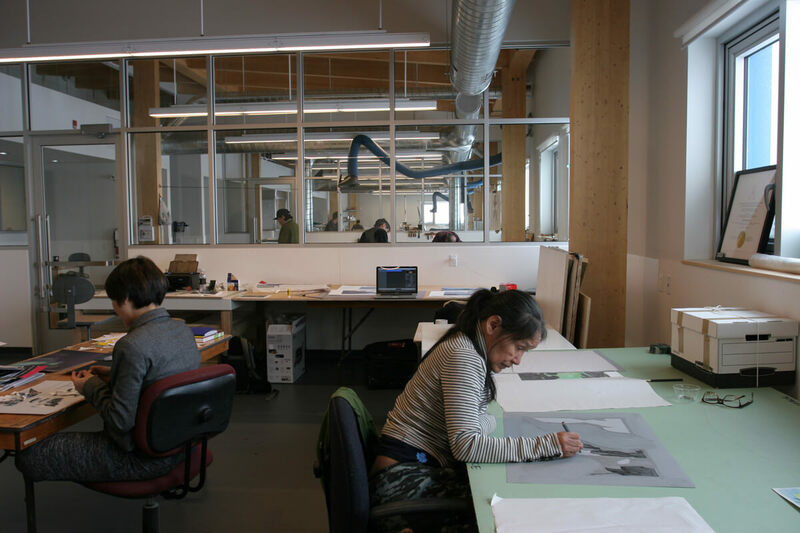 Shuvinai Ashoona (right) works on a lithography plate in the new drawing studio.